Finally, somebody remembered how to make an action movie. And even more impressive, somebody reached deep down into the vault to manage a sequel. Discounting Harry Potter and Lord of the Rings as they fly too close to the sun to qualify for as an action movie as I define the genre, you have to go back a ways to find a franchise willing to put this much effort into a sequel. Most take the road of Lethal Weapon and Die Hard and sloppily chop together scenes of the main characters in front of a green screen of massive explosions and catch phrases. This was a throwback to the days of Back to the Future and Indiana Jones. And say what you want about the Kingdom of the Crystal Skull, but the movie didn’t lack for effort. It’s just hard to build a sandcastle without water. Or sand. 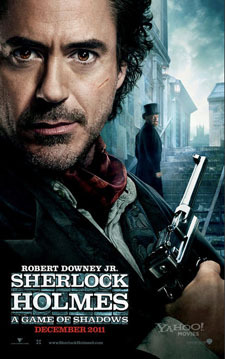 In A Game of Shadows, Robert Downey Jr. plays the same character he always plays, but we like it and he does it well. And the refreshing interplay with Jude Law is what successfully adds the element of buddy comedy, pushing it past most other attempts at action movies. But it took the action sequences seriously, whereas the Lethal Weapon 2, 3 and 4 storyboards were written on napkins with the words “Joe Pesci,” “Renee Russo” and “Chris Rock” scribbled on them. A Game of Shadows trusted the action sequences and the strength of the main characters to drive the ship. They barely even needed to rely on Rachel McAdams to sell tickets. The foundation of this film, however, lies in the action sequences and the creative ways in which they are approached. Holmes’ observation of the world around him yields way to either flashbacks of things that happened or flashforwards to things that will, like a really high-budget episode of Psych. It is shot with slow motion and close-ups that enhance the action without being annoying or gratuitous – well, maybe a little gratuitous. The story was tough to keep up with, but it didn’t detract from my enjoyment of the film. I didn’t get The Big Lebowski the first time through either. The action may be the foundation, but Downey Jr. is the meat and/or potatoes of the film. I’m willing to bet his MMA, drag queen version of Holmes isn’t Doyle’s original concept of the character, but it made for good cinema. This is more than I can say for J Edgar, which was hampered by the need to stay true to a character. And yes, I realize he is an actual person. Despite the lack of obedience to the original character, I thoroughly enjoyed A Game of Shadows. And isn’t that the point? 9 bugs.